It just wasn’t quite there. The same players were in the game, with the same coach and the same fans that have been in RIMAC Arena all season long. But the results were different. The previously undefeated UC San Diego women’s basketball team, the no. 1 seed in the NCAA Division II West region, fell to the no. 4 Azusa Pacific University Cougars 64–61 to end their 2018-19 campaign, one of the best in program history. The team brought its characteristic energy all game long, as did the home crowd, but the active hands of the visiting Cougars kept the Tritons from setting up their usual offense. UCSD shot a mere 28.2 percent from the field on the night, which was less due to poor shooting and more a result of tremendous defense from APU. Most notably, junior forward Mikayla Williams, the Tritons’ leading scorer during the regular season and the Division II Conference Commissioners Association West Region Player of the Year, scored just 4 points in the loss, on 2–6 shooting from the field. Height wise, the Tritons were overmatched, something that the team could not overcome on offense or defense. The matchups the Cougars were able to create down low, both with their twin sister junior guards Savanna and Daylee Hanson, who each stand at 6 feet, and with their 6-foot-2-inch sophomore forward Laura Pranger, were too much for the smaller UCSD lineup. The Hanson sisters and Pranger combined to score 41 of APU’s 64 points, mostly in the paint. Daylee led all players with 23 points, while Savanna and Pranger added 9 points each. Pranger’s significant length helped her dominate the paint for the Cougars, patrolling inside against any interior shots the Tritons attempted and accumulating 6 blocks by the end of the game. UCSD had one of its toughest shooting nights of the season, as it had almost no good looks inside thanks to APU’s relentless defense. The Tritons’ only points came from 3-point shots for the entirety of the first. 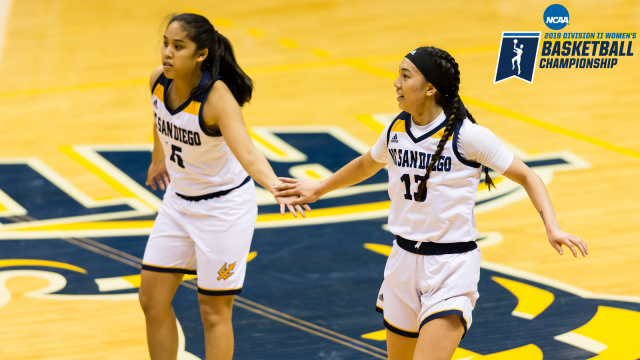 The team’s first non-three-point basket came via a free throw from senior guard Kayla Sato with 6:59 left in the third quarter, and on the next possession Williams hit a contested layup inside, marking the first non-three-point field goal for UCSD. The Tritons were firmly in the lead for the first 11 minutes of the game, but the Cougars continuously pounded the ball inside while also hitting the few threes they took, ultimately taking the lead with an 11–0 run in the middle of the second quarter. APU never relinquished the lead from that point on. The closest UCSD came to tying things up was late in the fourth quarter. Freshman guard Brianna Claros hit 3-pointers on back-to-back possessions to bring the score to 59–57 with 34.3 seconds left in the game. The energy level in the arena was at least as high as it had been at any point all season long, with chants of “DEFENSE!” being echoed throughout the gym, but to no avail. Daylee Hanson hit the game-clinching shot, a heavily contested layup with 19.8 seconds remaining, forcing the Tritons to foul the Cougars in each of their last two possessions. UCSD brought the score back to within 2 at 61–59 on the next possession on a pair of free throws from Yang, but APU’s free throw specialist senior forward Samantha Huddleston hit two free throws to bring the deficit back to 4 with 10.9 seconds left on the clock. Junior forward Haleigh Hatfield made a pair of free throws herself to bring the score back within 2 once again with just 4.3 seconds remaining, but the Cougars’ freshman guard Lydia Nieto scored on the second of her two free throws to push the lead up to 64–61, and the Tritons, with no timeouts remaining, could only throw up a desperation three with the few remaining seconds remaining on their historic season. The loss unleashed a great wave of emotion at the close of the game. It marked the end of a 30-win, undefeated season and the last game of Sato and Yang’s careers. But the team was not too hurt to be kept from recognizing the astonishing nature of both this season and this team. The team’s incredible chemistry was visible both from the stands and from the coach’s seat on the bench, not only in the gut-wrenching loss but all season long. They deserve to be proud. This team put together the most incredible run in school history, with an undefeated regular season and California Collegiate Athletic Association tournament victory. This team was capable of bringing the crowd to their feet with odds-defying 3-point shooting and jaw-dropping buzzer beaters. The standard of UCSD women’s basketball has been permanently raised by this team’s performance, and the program will continue to build on this momentum as the school pushes towards its transition into Division I.